George M. Eberhart is a librarian with a special interest in all things unusual, from UFOs and Bigfoot to ESP and ghosts. 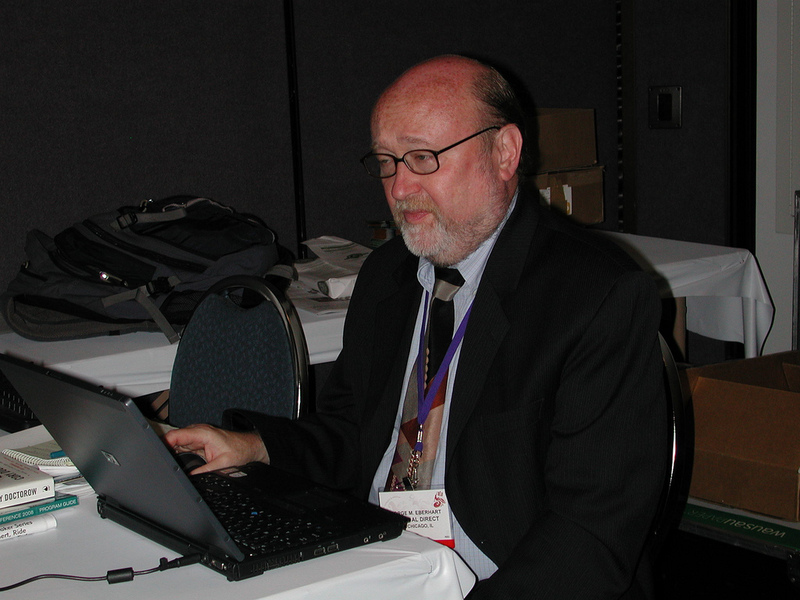 He is employed at the American Library Association, where he is currently editor of American Libraries and is the compiler of The Whole Library Handbook: Current Data, Professional Advice, and Curiosa about Libraries and Library Services and its subsequent editions. TheWhole Library Handbook is a guide for library professionals that contains "everything you ever wanted to know" about the profession and library facilities, according to Cathleen Bourdon in American Libraries. He belongs to the J.Allen Hynek “Center for UFO Studies” (CUFOS) of Chicago, Illinois. I use UFO exclusively, since few people know what UAPs are, even though the definition is more encompassing and perhaps more descriptive. I really have never had a fixed opinion on what UFO phenomena represent, other than they are multicausal. Some may be extraterrestrial, others interdimensional, others psychic in nature, still others forms of unknown natural phenomena like earthlights, and others a psychological yet anomalous effect. If you take every incident on a case-by-case basis, after you weed out the many probable hoaxes and misidentifications, you are left with a bizarre array of causal stimuli that only have a small subset of common characteristics. Over time, I have gotten more rigorously skeptical, though still open-minded. Absolutely. Just as a cryptozoologist needs to know what real animals might masquerade as a cryptid, the ufologist needs to be an expert on meteorology, eyewitness testimony, elementary physics, psychology, astronomy, history, and many other subjects. 4) If there were still some unexplained phenomena, what could it be? I think I answered that in the second sentence of question 2. I consider myself more of a bibliographer and historian of the subject. I would like to see UFO literature and documentation more widely accessible and critically assessed. More care needs to be taken in individual cases to get the details right on old cases as well as new ones. I’ve learned much over the years by just studying the subject, and I think others might too. It almost doesn’t matter what specific cases turn out to be or what the phenomenon is as a whole. We live in a postmodern world where any ill-informed person can have an opinion on any subject without bothering to acquire mastery of the field. It’s too much work to learn complex philosophies, and there’s no money in it. I’m not sure what I’d want to change peoples’ minds to anyway. A scientific, replicable confirmation of the nature of anomalous UFOs will convince many people (if and when that happens), but there will still be those who will allege fake news or conspiracies. It’s not worth trying to convince anybody of anything. Maybe it’s better just to have a reasonable conversation. Yes, especially as different techniques are now being used to creatively search for exoplanets, exobiology, and exotechnologies. Even if you don’t find anything, you will still learn something about the nature of the universe. Unproven, but the debate is intriguing. I’ve heard Neil de Grasse Tyson and Michio Kaku go on quite reasonably about multiverses via string theory, but I don’t really understand any of it. Nothing has been proven yet. Maybe George Adamski’s golden-haired “Venusians” will return some day and explain it all to us. Rodrigo Andrés Bravo Garrido is an Officer of the Chilean Army born on May 2, 1976 in the city of Santiago de Chile. He specialized as a Military Pilot and currently works in the Army Aviation Brigade. He is known for being the first serviceman in active service in Chile who conducted formal studies and opened the debate about the phenomenon of UFOs in the aeronautical world of his country. He is the author of two books: in November 2010 together with Juan Castillo Cornejo published the book "Ufología Aeronáutica" ("Aeronautical Ufology"), a new concept in the study of UFOs. In 2017 published "Los Extraterrestres han Muerto - Tomo I" ("The aliens have Died" Volume I) and currently is preparing the Volume II. Together with his professional pilot activities, he works in the area of aerospace security and continues his research in ufological matter attached to critical thinking. 1. Do you use the acronym UFO or another designation, and if so, why? I use the acronym UAP (Unidentified Aerial Phenomenon) for the analysis of these manifestations’ reports since the acronym UFO possesses several disadvantages, such as the corruption and charge of the word itself, which is forcibly associated with the extraterrestrial hypothesis. On the other hand, the fact of tagging UFO as an unidentified flying object. The word “object” has a physical connotation, and therefore, that because of its components it should be picked up by an electronic system such as RADAR, which in most aeronautical reports does not happen. It is for this reason that the word phenomenon and, ultimately, the acronym UAP are more fitting. 2. Have your idea about UFOs changed along the time? The idea I have about UFOs has not changed since I started to study this phenomenon. Despite all of the existing hypotheses, I have never identified with any of them because of the strange characteristics, lack of consistency and intricacy of the reported manifestations. 3. Should the UFO investigator become an expert in IFOs? 4. If there were still some unexplained phenomena, what could it be? There are still unexplained phenomena where, despite conducting a thorough investigation on each of them, the cause for these detected, registered and reported appearances could not be established. 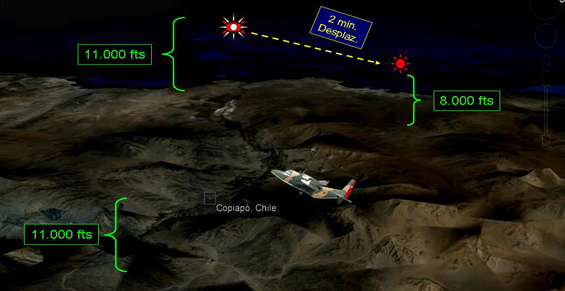 Two examples: Punta Arenas, Chile; March 03, 2011 (UFO detected on RADAR and observed by two aircraft in mid-flight). Santiago, Chile; September 03, 2012, Air War Academy case (five lights carry out erratic moves in the sky nearby the military facility). On old cases, there is a serious issue which is that, in many of them, research was not carried out properly. 5. How do you consider this issue in general? What do you think about the whole subject? The issue is much more interesting than it appears to be, leaving aside all of the speculations that ufology has established. The subject is connected to our ignorance of many aspects of nature around us. For instance, about the phenomena taking place on the atmosphere, we know very little about what goes on above de stratosphere; this fact alone indicates that there are many manifestations of which we have no knowledge of cause or origin. In the same way, how many astronomic phenomena are known exclusively by the scientific community? Well then, what about the rest of the people? 6. Is it possible to do something effective to bring the truth to the public and to change the mind of those who still proclaim or believe that extraterrestrial beings are living with us on Earth? It is important to promote all fields of knowledge that are involved with this phenomenon. But for me, the most important part is to confront all those ufologists, mystery propagators and charlatans who have taken over this subject. It is imperative to participate on ufology conferences and face them in debates; in this way the public can learn that the ideas of believers and traders are not the only ones and that this phenomenon is being earnestly researched. 7. Do you think SETI and similar searches are valid activities? Yes, I believe all scientific activity within the research methodology guidelines will help, one way or another, to the increase of knowledge. Let’s not forget that knowledge is a historical gathering of information that is permanently reviewed, and is in this way that what we call science is created. The search for life and intelligence in the universe is an agenda that should always exist. 8. What is your idea about multiple universes? More than an idea, I think they are possibilities, but as long as they are not backed by research and theoretical evidence they will always be no more than possibilities. The Spanish researcher Juan Carlos Victorio analyzed the observation made by Cap. 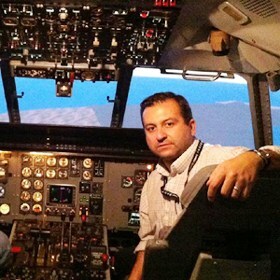 Rodrigo AndrÃndrés Bravo Garrido, and concluded that the military pilot had seen the Venus Planet. For his part, Bravo Garrido answered him clarifying the situation experienced by the military crew and denying that Venus was the anomalous sight, without prejudice of having seen Venus. There is - on the other hand - a confusion regarding the date of the event. Victorio refers to March 22, 2012, Bravo Garrido in his response says that the event occurred on the 21st of that month, and in this survey refers to the sighting as happened on the 20th. We transcribe the text of Victorio and the answer of Bravo Garrido. He leído atentamente el pródigo análisis que confeccionaste en relación a la Observación de un FANI reportada el 21 de Marzo pasado. Te felicito por el incisivo trabajo e indagación en materias astronómicas, pero debo agregar algunos puntos que no se consideraron en el Blog, el cual retire voluntaria y no misteriosamente de la Web, en espera que culmine la investigación oficial del CEFAA. El primero de ellos, es que en todo momento estuvo a la vista de la tripulación la estrella que corresponde al planeta Venus. Y en el caso que esta fuese confundida, por parte de los testigos (nosotros), no creo que ese “planeta” observado, pueda aumentar y disminuir su tamaño de manera tan rápida, al igual que los cambios de colores que efectuó. Si por efectos de la atmosfera, se produjese la difracción de la luminosidad, es muy poco probable que este “planeta” se desplazara en descenso desde el punto inicial de la observación, hacia el norte, vertical Caldera. En lo personal llevo varios años investigando el Fenómeno Aéreo Anómalo, por lo que antes de reportar esta situación, los cuatro de la cabina conversamos y comprobamos el comportamiento anormal de este fenómeno luminoso, antes de reportarlo por frecuencia y de presentar los informes correspondientes en Operaciones Aéreas. No me interesa saber o indagar las causas, ni los motivos de la manifestación de este fenómeno aéreo, lo que si está más que claro, es que el Planeta Venus no era y que en momento de su rápido incremento de tamaño, fue considerado y representaba para nosotros otro tráfico inmediatamente al frente, en sentido contrario. Por lo que provocó una situación de potencial peligro para la operación aérea que estábamos desarrollando. Una cosa es la opinión personal conforme al relato de lo sucedido, otra cosa es una indagación más profunda y menos aficionada de un reporte anómalo aeronáutico, ya que se deben cubrir todos los antecedentes, como los relatos, grabaciones etc., y por ejemplo, el que tú señalas de la meteorología, está con errores.